We are the largest home-team tailgate at FedEx Field, supporting our Redskins every game from our spot at G20. The HailBBQ Tailgate is a Redskins-Fan-First Tailgate. We accept fans of the opposing team, but space is limited to Redskins fans and the member referrals of the HailBBQ Crew, PFUFA or the Tailgate Hall of Fame. If you are an opposing team fan and you wish to join us for a tailgate, please request approval via email and we will let you know if we have additional room at the tailgate. Every game is a new menu. We craft special treats for our guests that are inspired by the cuisines of our visiting opponents. It takes a lot of dedication to host over 300 fans. 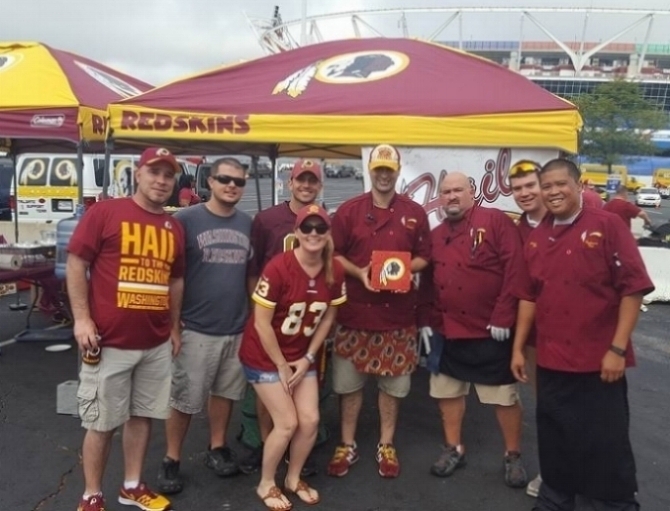 Meet the Hail BBQ crew who cooks the best food at FedEx each game day.